Oh, Honore! Wow! I love those fabrics! You inspire me! As you so inspire me, too! Your quilt fabrics are lovely, and just the thing for a grey day in February! 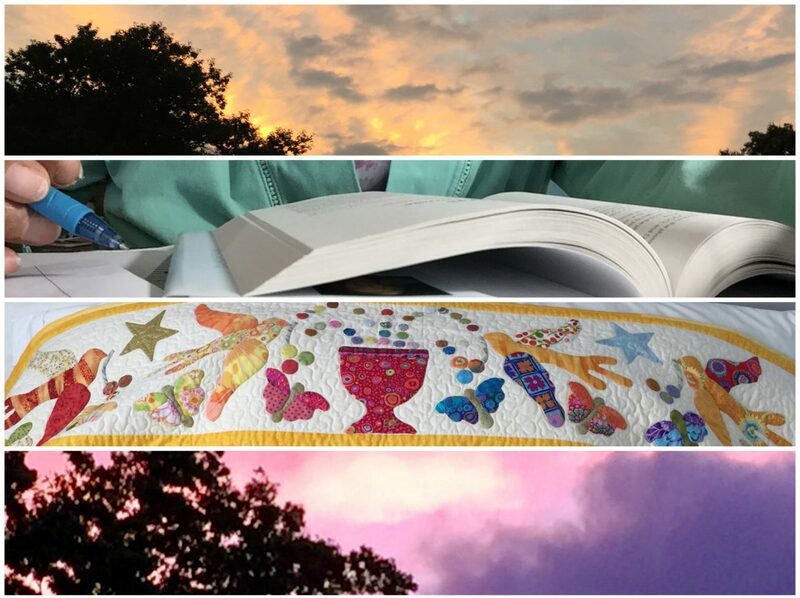 Three quilts for the quilt show sounds like a great accomplishment (and I hope we get to see them)! Thank you! And yes, I shall share the three before the show! The other too are much smaller…stay tuned! Love those fabrics! I want to read Inheritance. Dani Shapiro is coming to town in a few weeks and I hope to go. I picked up my copy of Digital Minimilism, but haven’t started it yet. Bummer that you missed the signing. Beautiful fabrics and I love the cloudy picture due to steam!! Love the colors!!!! They would cheer me right up. 🙂 I just read Inheritance and liked it very much. The quilt blocks are gorgeous; can’t wait to see the finished product! Inheritance is on my TBR. I first read about Digital Minimalism right here, but have seen one reference after another about it. Think that needs to go on the list as well. Such pretty fabric in those quilt blocks. Keep us posted on your quilting progress. I enjoy Patchett’s writing. We had an interesting discussion in our book group about Truth and Beauty. I have Educated on my list too. I finished Obama’s book and am still thinking about her story. I’m always impressed by your discipline as it relates to quilting, knitting, reading, writing, and life in general. I’m always attempting to learn from your example. Beautiful fabrics in your quilt top. I’m looking forward to seeing the finished quilt. Thank you for sharing your delight and discipline.